On the nibbled lawns above the Painted Cliffs on Maria Island, a crowd has gathered under the setting sun. 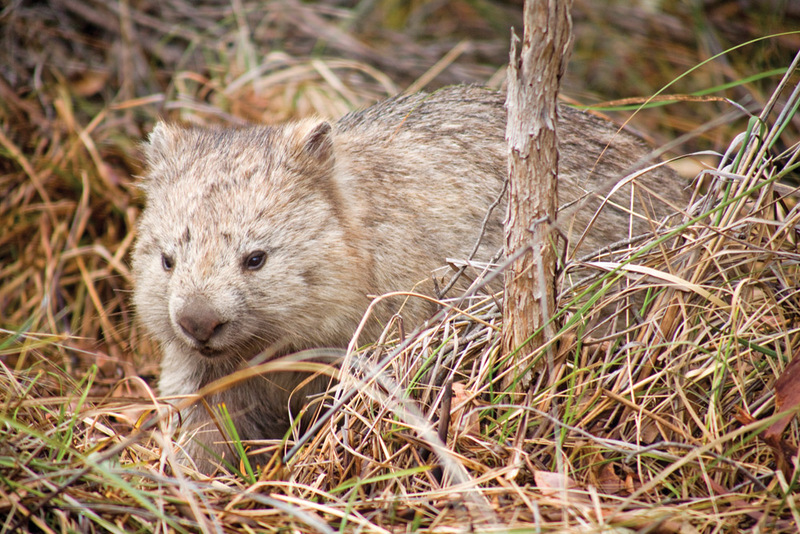 Wombats bustle about, wallabies graze and a pair of Cape Barren geese dash about, honking like belligerent motorists. Behind me are the buildings of Darlington, a World Heritage-listed former convict probation station, and where the lawns end ahead, the world falls away into the swirling sandstone patterns of the Painted Cliffs. It’s a moment that seems to encapsulate the remarkable diversity of this one Tasmanian island, which somehow feels like a dozen different places in one. 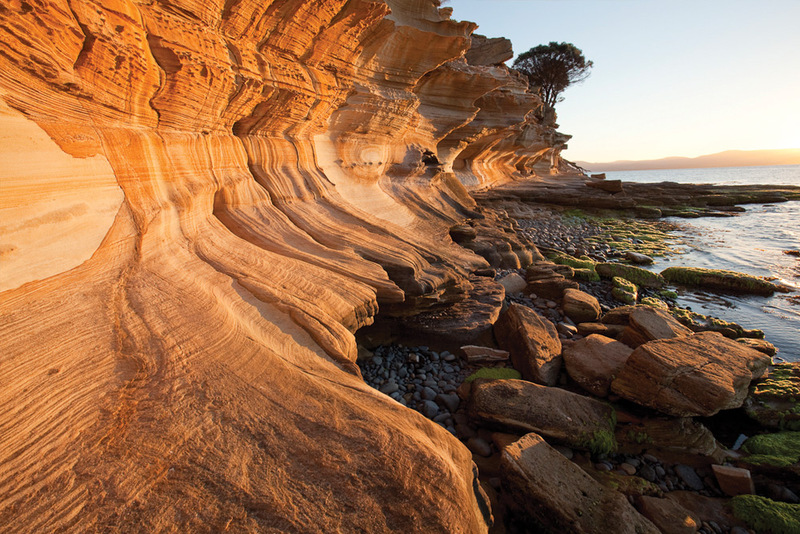 The Painted Cliffs, Maria Island. Image courtesy of The Maria Island Walk. I’ve been walking on Maria Island for three days, and already it’s clear that it’s a place like few others. On this floating national park, natural history and human history merge in a spectacular island setting. Craggy peaks rise up to 711 metres from the Tasman Sea, underscored by glorious white beaches. The convict station predates Port Arthur and the island is now arguably the surest place to sight a Tasmanian devil in the wild. And it can all be seen on foot, at gentle pace. I’ve come to the island with The Maria Island Walk, a four-day guided walk that will take us from toe to tip of the dumbbell-shaped island that’s held together by an isthmus about as thin as four-ply. Reidle Beach, Maria Island. Image courtesy of The Maria Island Walk. It’s on the isthmus that we begin our walk after a boat ride across the Mercury Passage from Triabunna. As we set out, heavy cloud shadows the Tasmanian mainland, but out here the sun is warm on our backs. 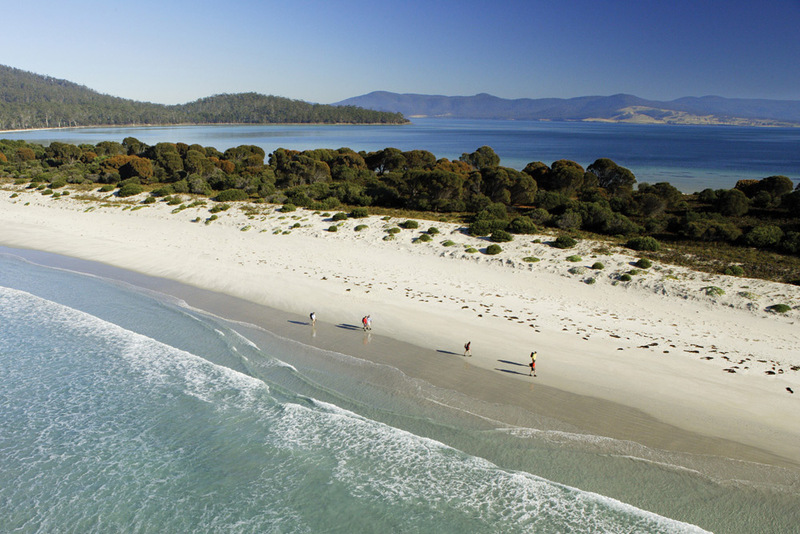 Daily distances on The Maria Island Walk, which operates from October to April, aren’t long, averaging around eight to 10 kilometres on firm beaches and bush tracks. This first day it’s a return stroll to the island’s little-visited southern shores. At Haunted Bay, a narrow nick in the coast, there’s a truly Tasmanian welcome as we descend past penguin burrows – some with their residents still at home – to a bouldery coastline smothered in orange lichen. It’s like the Bay of Fires with extra flare. Camp this night is back at the isthmus, though to call it a camp is to undersell it. Dotted through the bush are the woodframed tents of one of the walk’s exclusive permanent camps. 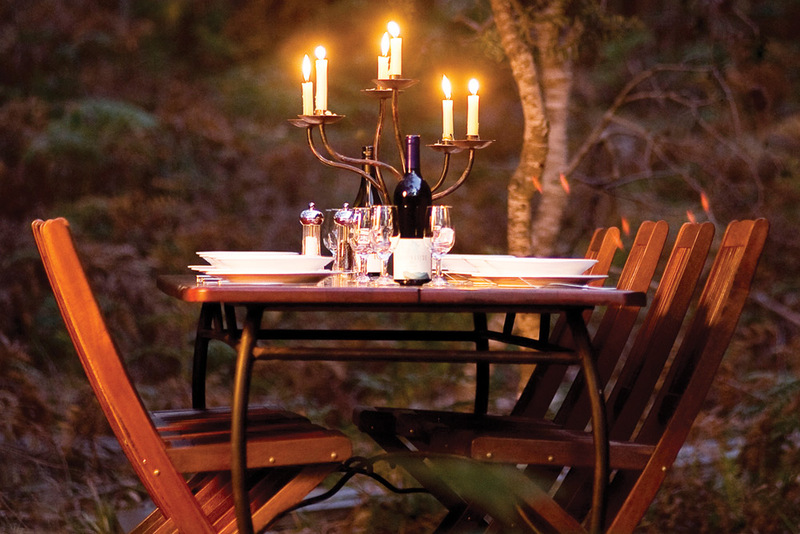 By evening, candles flicker as we sit out at the dining table for dinner – an atypical hiking meal of stir-fried Spring Bay scallops with risotto and asparagus – with our enthusiastic guides dispensing island knowledge as generously as they serve the food and local wines. Each day, like each meal, has a different flavour on this eclectic island. “Today’s the day of five beaches,” guide Karen announces on our second morning, making it sound like a Mediterranean cruise on foot. As we walk between this quintet of beaches, there’ll be Aboriginal shell middens, an abandoned farm and woolshed, and colourful cliffs of ochre, chalk and clay. Candlelit dining at Casuarina Beach Camp. Image courtesy of The Maria Island Walk. The following day we’ll scramble to the summit of Mt Maria, the island’s highest peak, for a view over the isthmus and far beyond. Then it’s into the convict relics of the island’s far north for our final morning. In Darlington, on our last night, the accommodation is in Bernacchi House, once the home of Diego Bernacchi, an entrepreneur who tried to transform Darlington into a thriving industrial and tourist hub in the late 19th century. He built a cement works, planted grape vines, began silk production and immodestly renamed the place San Diego. To tourists he billed the island as the 'Riviera of Australia’. The ventures failed, but the house now provides Maria Island Walk guests with the rare treat of accommodation inside a World Heritage precinct. Wombat, Maria Island. Image © Andrew Bain. Warmed by a fire, with a dinner of crispy skin salmon and lemon tart coming to the table, it’s a tempting place to sit and laze. But as dusk nears, I wander out instead across Darlington’s lawns towards the Painted Cliffs. In 2012, Tasmanian devils were released on the island to build a disease-free population, and the animals are now regularly sighted around Darlington. But this evening they’re about the only creature missing as I cut a lone figure among the wombats, wallabies and Cape Barren geese. On this car-free island national park, this is as crowded and stressful as things get. I’m a hiker, a cyclist, a rather poor but keen paddler, and an occasional climber with an irritating case of sewing-machine leg. But I’m also a father, a reader and the bloke you might see happily trundling around alone on my bike when everyone else is in a bunch. All the while I’m probably thinking about the next wild place to which I’d like to disappear.